Circa 1861. Sitting in the historic village on a bluff overlooking an ocean cove, this inn lightens the sprits just as the name Alegria means when translated. The main house was built in 1861 as a saltbox and recently renovated. 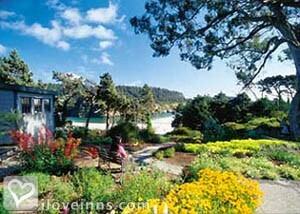 Stay in one of the guest bedrooms or a private cottage. 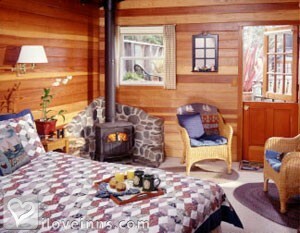 They all feature generous amenities and some include wood-burning stoves. The second-floor Pacific Suite boasts a microwave and wet bar sink. 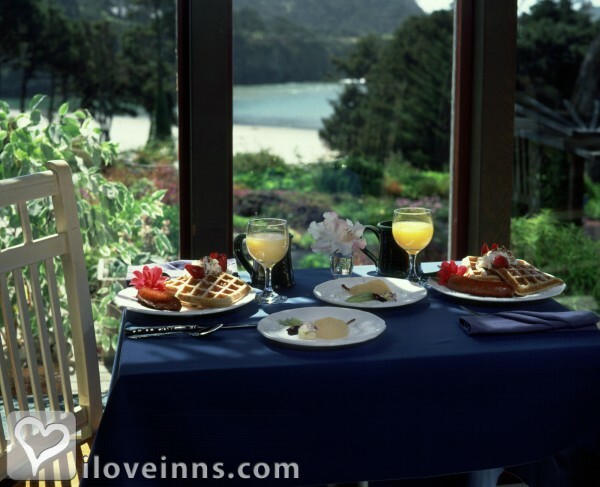 The ocean view dining room is the perfect spot for an incredible breakfast that is made with organically grown produce when possible. The ever-changing perennial garden includes antique roses and a relaxing hot tub. 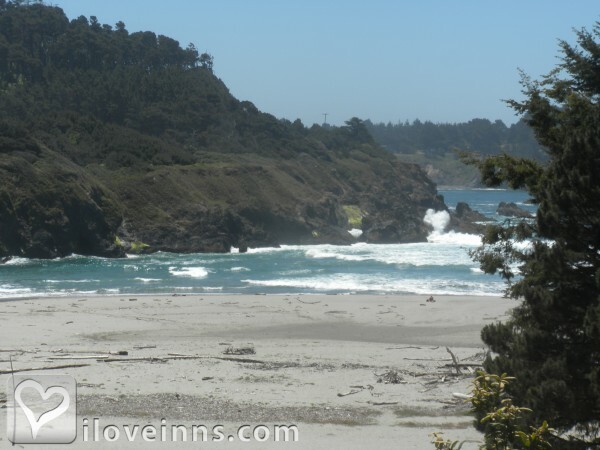 Take the trail 200 footsteps from the garden's edge down to Big River Beach.Publicity and Awards: Country Inns Magazine, Horticulture Magazine.Location: Ocean Community, Waterfront and Wine country. Step inside this spacious room and be greeted by a panoramic view: the hills to the east, the perennial garden, the beach where the ocean meets the river, and the ocean beyond. One of only two guest rooms in the Main House (both on the second floor, separated by a stairwell and each with its own private outside entrance), the Pacific Suite is the most luxurious; elegant custom woodworking, a cozy fireplace, a separate bath and shower, walk-in closet, ample counter space for setting out snacks and drinks. Enjoy the outdoor splendor from your private, south-facing deck. Your own private retreat is the upper floor of our Carriage House. (The first floor is used only for storage.) 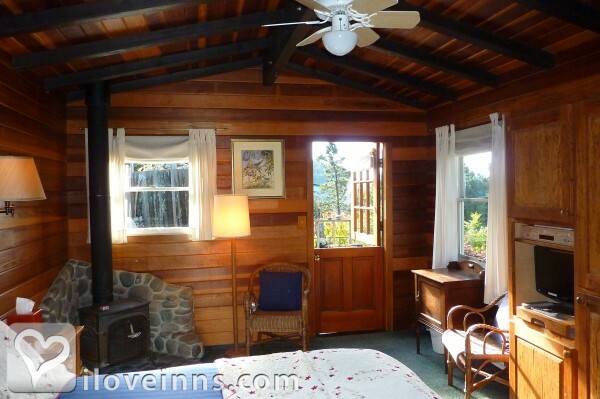 Stargaze through the skylights from the California king bed, or get cozy by the fireplace. Take in the blue water ocean view from the chairs in the nook, the shower and sunny private deck. Payment types accepted include Visa, Master Card, Travelers Checks and Personal Checks. 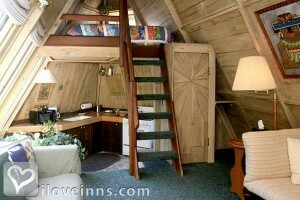 Rooms: This property has 6 total guest accommodations, 10 with private bath, 1 suite and 4 cottages. Minimum Stay Requirements: Two-night minimum required on weekends. Three-night minimum required on some holidays. 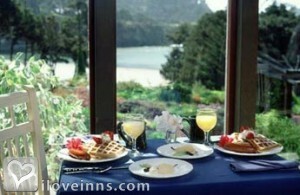 Types of meals: Vegetarian Breakfast, Full Gourmet Breakfast and Early Coffee/Tea. Amenities In Room: Cable TV, Reading Lamps, Refrigerator, Ceiling Fans, Clock Radio, Coffeemaker, Television, VCR, Fireplace, private decks, panoramic ocean views, some with wood burning stoves, microwave and wet bar sink. Amenities On Site: Copy Machine, Phone, Fax, Fireplace, Hot Tub/Spa and Gift Shop. Events Hosted: Family Reunions, Weddings and Romantic Getaways. Other Activities: Art Galleries, Beaches, Bicycling, Canoeing/Kayaking, Fishing, Golf, Hiking, Horseback Riding, Live Theater, Museums, Parks, Shopping (Local Crafts), Tennis, Wineries, used book store, Big River Beach, Big River Estuary, Headlands State Park, Montgomery Woods, Jackson State Demonstration Forest, Van Damme State Park & Beach, Russian Gulch State Park & Beach, Caspar State Beach, Mendocino Coast Botanical Gardens, Glass Beach and MacKerricher State Park & Beach.